If one food summed up my past year it would be the large chewy cookie. The ones you can buy fresh from the bakery section in the Sainsbury’s across the road from my college. Do you know the ones I mean? They have been the saviour of many a dull and tired day. There may even have been a week here and there when a new packet was a daily occurrence. Those were bad weeks. I know a guy who will eat a whole bag for his lunch most days and a girl for whom getting through two bags in a day isn’t a rarity. I must say I have actually run to the shop to buy a packet when my friend told me they’d just put out a new, warm batch. There were none left. Major disappointment. 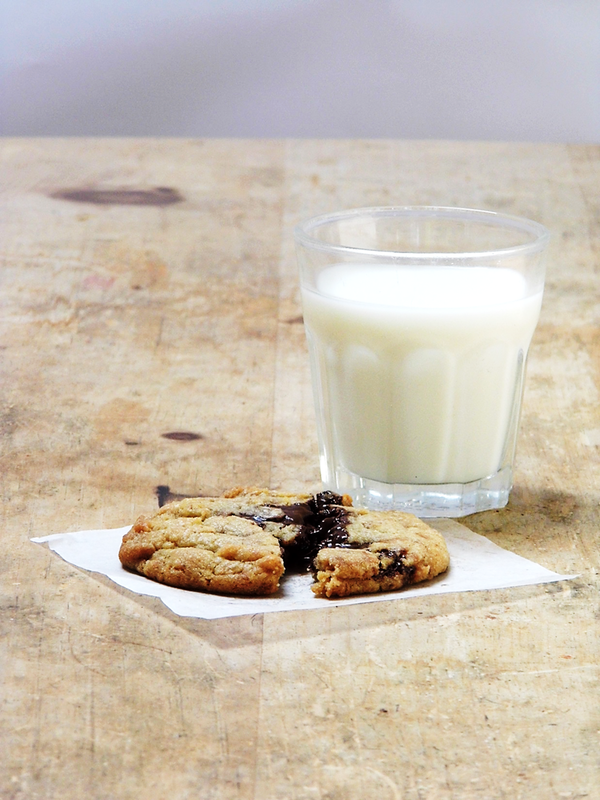 But come on, who doesn’t like a chewy cookie? My first week at college certainly answered that question: no-one. There didn’t seem to be a single person who wasn’t carrying round a packet of discount bakery cookies. It seemed such a small price to pay for five fresh, perfectly soft chocolate-studded beauties. The supermarket managed to tap right into what we needed, targeting weak-willed, energy-lacking students with the knowledge that buying a packet of these might make the day slightly less of a drag. These baked delights set me thinking – there must be a way to recreate something similar in my own kitchen. Trying to make a chewy cookie is much harder than you’d think. It has taken months of testing and retesting recipes to reach this point but I’ve finally found something close. 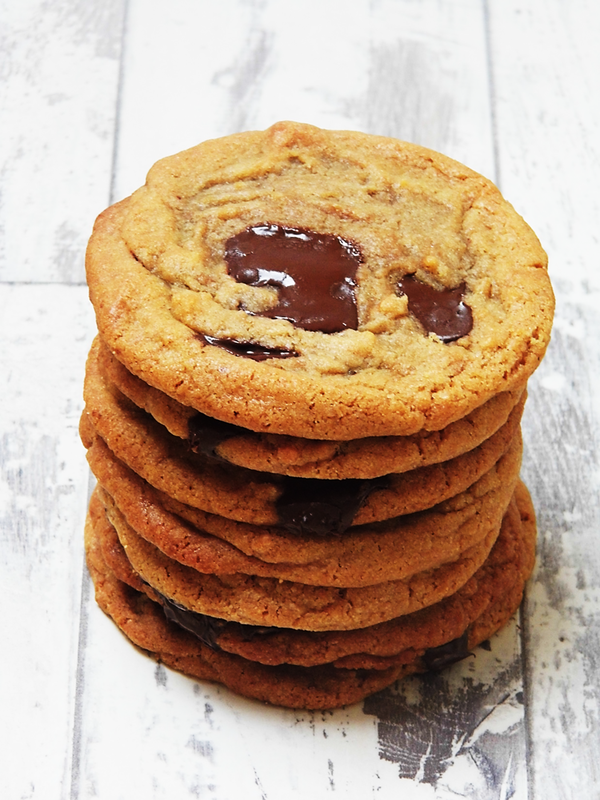 This recipe does make slightly darker, more buttery cookies than those I’m used to, due to the browned butter and brown sugar that add a slight nuttiness and caramel flavour that would benefit any cookie. For those of you who are seeing ‘browned butter’ and scratching your heads as to what it is, it’s simply ‘unsalted butter that’s melted over low heat and allowed to separate into butterfat and milk solids. The milk solids naturally sink to the bottom of the pan and, if left over gentle heat, will begin to brown.’ (Thank you very much, Wikipedia.) Essentially your butter will become brown and have a lovely nutty, slightly caramel-y flavour – a very cool phenomenon. One thing I’ve learned is that you want to under-cook your dough. Trust me. Please. When you look in the oven and they’re only just going golden at the edges, that’s when you should take them out. 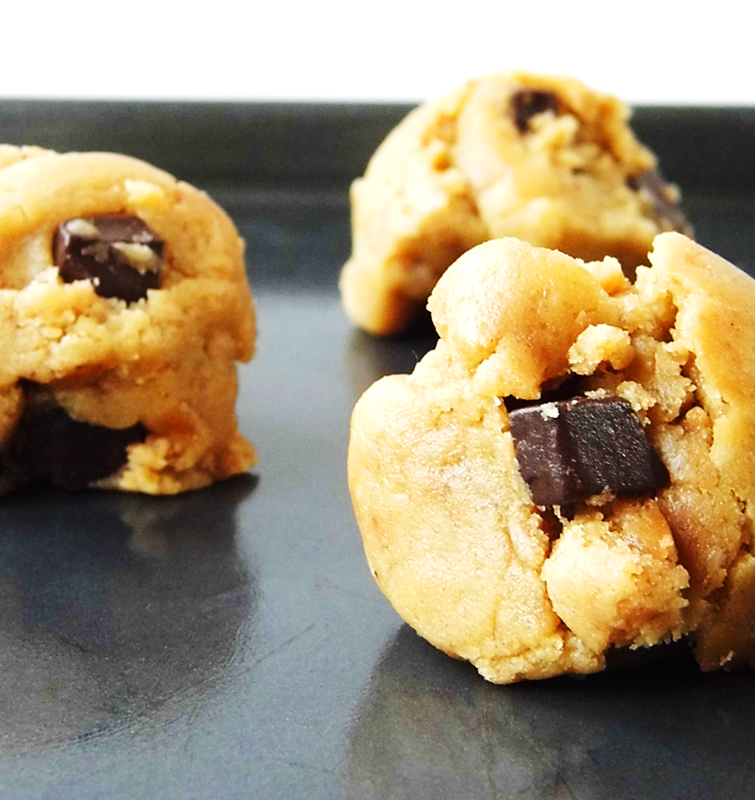 Wait until they’re golden all over and you’ll have one tough cookie. You’ll be left with a biscuit, not a cookie and that would be very sad. Don’t let it happen, please, for the sake of the cookie. 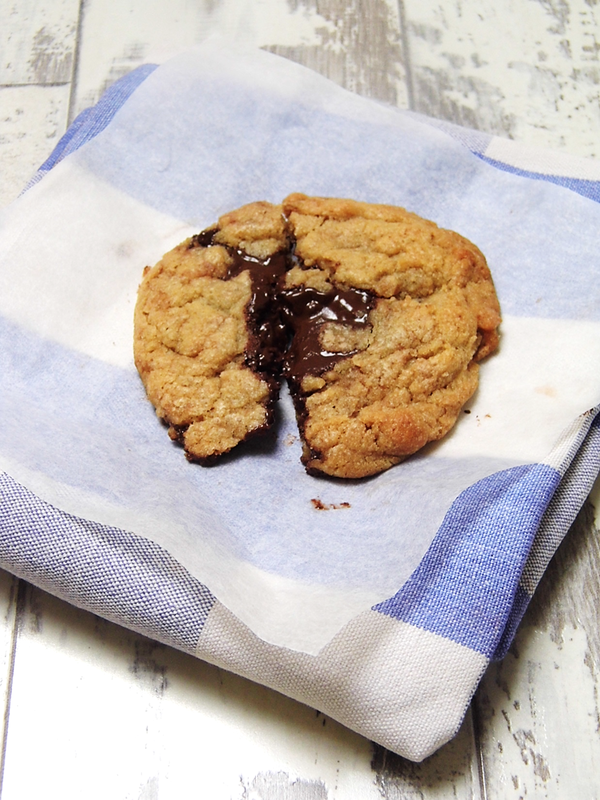 A eureka moment in developing this recipe (which yes, did include a dance routine in the kitchen) was after a friend said she’d heard somewhere that to make cookies chewy you need to remove the tray from the oven half way through cooking, and give it a few sharp taps on the work surface . It works. It actually works. It knocks out all the air that can make them a bit cakey and crunchy. This part of the recipe is essential – DO NOT miss it out, they won’t be the same. Extra chewiness is also thanks to honey, an egg yolk and cornflour. Place your butter in a small saucepan and heat until it’s melted. Once melted, turn up the heat and watch it like a hawk, it can easily go past ‘brown’ and onto black. It will start to bubble and spit; don’t be alarmed, just be careful. At a certain point it will start to foam and you will be unable to see below the very thick froth. Keep heating until it smells fragrant and the butter’s turned an amber colour. Take it off the heat and pour into the bowl to cool slightly. 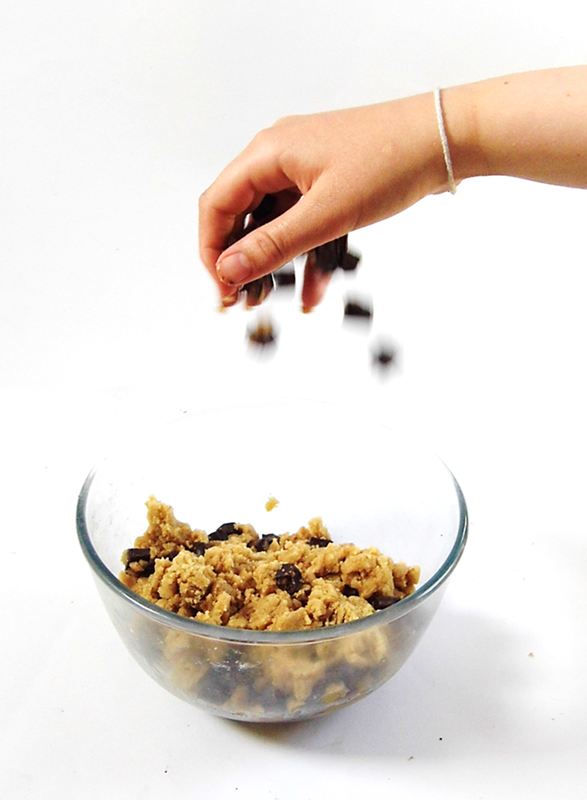 Make sure you scrape any little brown bits into the bowl as well; they’re what give it its flavour. Mix the sugars into the browned butter and beat until paler in colour and no lumps remain. Whisk in the egg and yolk and then add the vanilla and honey. Mix in the flour, bicarbonate, cornflour and salt until you can’t see any flour. The dough will be quite soft. 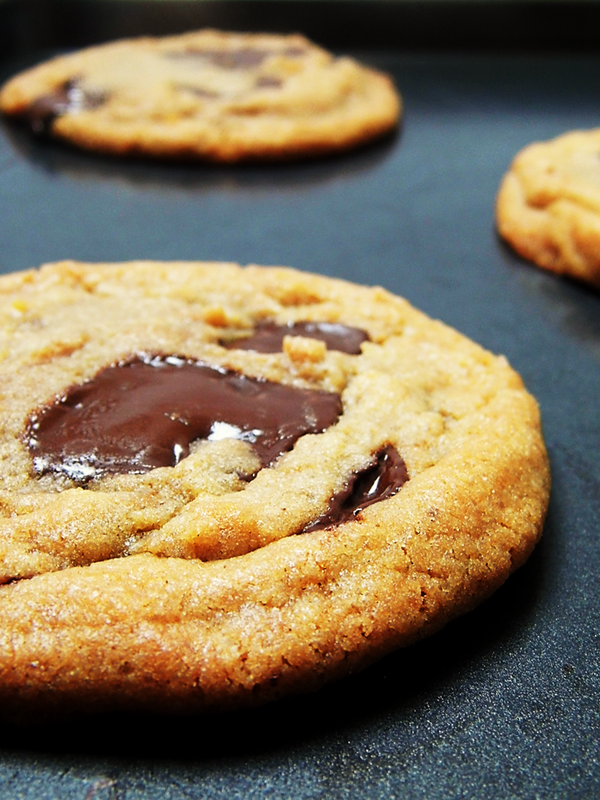 Fold in the chocolate chunks. Cover your bowl in Clingfilm and place it in the fridge for an hour or so. Preheat oven to Gas mark 4/180°C. Grease your baking trays. Using an ice-cream scoop, place scoopfuls of the dough about 10cm apart on your baking trays. Place each tray in the oven for about 7-10 minutes or until the edges have started to go golden and the middle’s still quite soft. ½ way through this time, take them out of the oven, bang the tray sharply on a flat surface a couple of times and return to the oven. Once done, leave to cool on the tray for two minutes and then lift them on to a cooling rack. absolutely can recommend these cookies – fab recipe making amazingly delicious cookies that never last long in our house. Remember to bang the tin though!